EasyEasy to follow but some steep slopes. 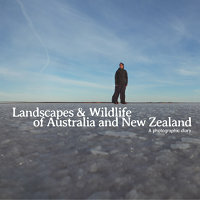 By car: 40 km east from the city centre of Melbourne. On Burwood Highway or Canterbury Road if you start from Ferntree Gully Picnic Ground. By train: take the train toward Belgrave and leave at the Upper Ferntree Gully station (not at the Ferntree Gully station, that is the one just before when we come from the city). When you get off the train, turn on the left to leave the station by the tunnel and follow the railway to the east (towards Belgrave). 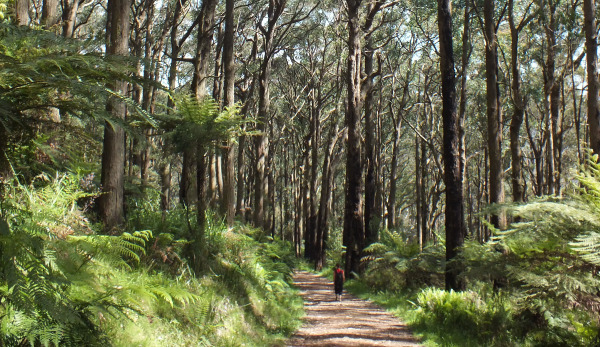 The Dandenong Ranges National Park is just about one kilometer, there is a small path on your left that you can take to walk a bit further from the railway and to bring you quicker to the trail head, at Fentree Gully Picnic Ground. To start, you have to climb. Two choices: Lyrebird Track or Kokoda Memorial Track (in tribute to world war II veterans in New Guinea). Both paths are steep but Lyrebird Track is wider and so it’s easier to let the joggers' climb the narrow crowded stairs of the Kokoda Memorial Track, which is damper than Lyrebird Track, narrow and have a few steps along the way (it’s supposed to have 1,000 steps, but if you believe the ones who really counted, it’s more between 750 and 800) and you have to move aside for joggers all the time. As you may understand, I prefer Lyrebird Track. Once you reach the summit, you leave behind you families coming here for their Sunday walk and sportspersons in fluorescent skin-tight clothes and you arrive at One Tree Hill Picnic Ground which is less visited than the picnic ground from the start of the walk. On the other side of the picnic ground, go on Tysons Track on your left and you’ll be able to enjoy a bit of peace and loneliness. Walkers are rare in this part of the park (we met only one person on this part that day). Take the first path on your right, View Track then the first on the left, Macedon Track. At the end of Macedon Track, you can take several tracks. Prefer Stony Rise Track, a stony (really?) and narrow path that goes down steeply, a bit more natural than the other fire trails, which are wider and gravelled. At the bottom of the path, take on your left Feather Track then on your right The Boulevard. Or, if you came by car, you can take on your left on The Boulevard then on the right on Belview Terrace to rejoin Ferntree Gully Picnic Ground via School Track on your left. You are now exiting the national park and entering a residential area, as you may read so on a sign at the end of the track. To go back to the station, the shorter way is to take on the left a small path between two properties: Hillside Cres (not easy to find). Then, you just have to go straight onto Jean Street and on the left on Hilltop Road. At the end, take on your left onto Railway Avenue, you walk next to the railway, so it’s not too hard to find the station. 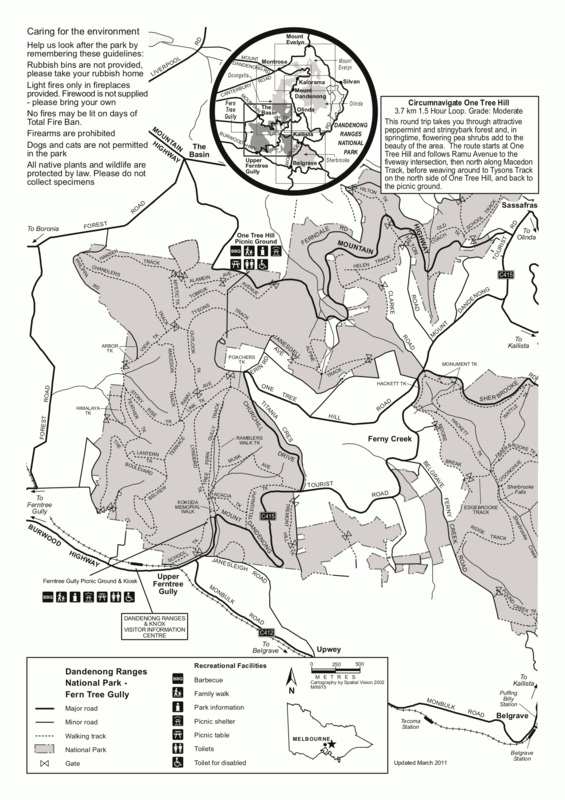 We walked many times in this part of the Dandenong Ranges, the first one a few time after our arrival in Australia, and the one described here a few time before my departure, that is to say around nine months later. My ears and my eyes should have got used to notice wildlife because if I saw only some parrots Crimson Rosella on the first time, this time, I saw kookaburras, king parrots, an echidna and a wallaby! The walk is a good getaway when you wish to get out from the city if you don’t want or if you can’t go too far. Choose a weekday if you can, when the weekend walkers' crowd is not there. The climb on Lyrebird Track (1.5 km to the summit) is quite steep and the descent can be a bit slippery when the weather is humid. But everything can be done if you are reasonably fit. Pros : verdant space easily reached from the city, chance to see wildlife. Cons : you sometimes hear the sweet sounds of the city (trains, horns …). Ferntree Gully Picnic Ground is invaded by families during weekends.